Rendering cinematic-quality results in realtime and running sophisticated simulations without sacrificing quality, NVIDIA Quadro RTX is unlike anything else on the market. Optimized to utilize ray tracing with SOLIDWORKS Visualize, design files can become photorealistic images at any point in the design or product review process. Deep Learning-enabled AI denoises images to provide fluid interactivity within the application viewport. Generative design, a form of goal-seeking AI, lets Quadro RTX move from a passive tool to an active assistant, enabling the exploration of more, or extremely innovative, design options. Whether exploring nuances of assembling an extremely complex product or assembly, Virtual Reality enhancements enabled by Quadro RTX, such as foveated rendering and simplified connectivity with Virtual Link, are changing the way products are designed, reviewed, and optimized for their intended purpose. Curious about the future of technology for manufacturing and product design? Want to experience the power of NVIDIA Quadro RTX in person? Visit the NVIDIA booth at SOLIDWORKS World 2019, stop by the PNY counter and enter to win an NVIDIA Quadro RTX 4000! 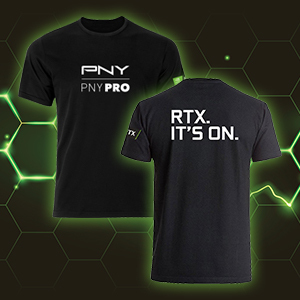 A limited number of special edition, RTX t-shirts will be distributed at PNY’s counter, so make sure you get there early! The future is waiting for you to grasp it!